This review is 99% hamster-free. In addition, this review will not cause any houses to explode, and produces no radioactive waste. You start off the game with a selection of seven different people. One of them you have to take, and you can pick two others from among the other six. Each of the people you can select has their own special abilities and talents, as well as dialogs and interactions. 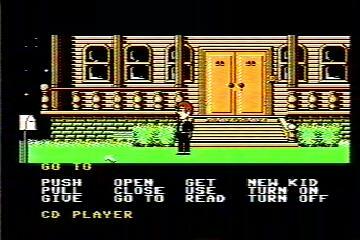 Your group starts off outside of a large mansion. The girlfriend of the character who you must take has been kidnapped and taken inside of this mansion. Not wanting her brains to be stolen or anything, you head in there to save her. You can take control of one person at a time, switching between them at any time you desire. Moving is done by selecting a spot to walk to with a cursor and pressing there, and your selected character will walk there. Actions are done by way of a panel of verbs at the bottom of the screen. That is, if you want to unlock a door with a key you have, you’d select Use from your menu, it would ask what you want to use, select the key from the inventory, it would ask what you wanted to use it on, and you’d select the door. Moving and performing actions can take some time, it’s certainly not overly quick and intuitive, but, you can do everything you need to, and it works well enough. Throughout the mansion there will be many items you’ll come across. While not all of them will be used, it’s a good idea to take anything that isn’t bolted to the floor, there’s a good chance that you’ll end up making use of it at some point. At times things can be a bit vague as to what exactly you’re supposed to do at a given point, but, basic trial and error usually works, and, while it is possible to lose, but, it’s not too bad. As mentioned, each person you can bring along has their own special set of skills and talents. One person may be able to use an item that other can not, while two different characters might deal with the same situation in different ways. There are many ways to beat the game, there isn’t one set path through to the end, and the paths that you can take will depend on who your members are. Graphics are nothing too special, the mansion has many things to interact with, but nothing that looks too detailed or intricate. Each character has their own music that plays when you select them, again nothing too fancy, but it is a nice way to tell which character you’re using. Beyond that, there’s nothing much in the way of sound effects or other music. 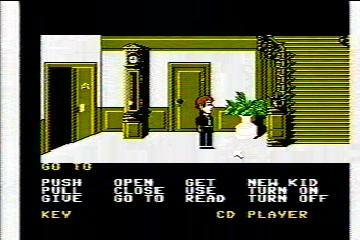 Maniac Mansion certainly isn’t the type of game that’s going to appeal to everyone. It is very slow-paced, and requires a good deal of thought, and sometimes just plain trial and error when things get a bit vague and confusing. The game really is quite fun though, just to be able to find so many items, and trying the items on different things. Even some things which really have no direct impact on completing the game, it’s just interesting to see the reactions some people have to certain things, or what results can happen when one combines an item with something else. It’s interesting to take along new people, try out their abilities, see what results they can produce, and how it can affect the game. As there are many different possible ways to beat the game, it’s always interesting to take along a new person, try out new items, follow a different path, and see where it leads. Even aside from actually trying to complete the game, it’s fun to just wander around, try things out, and see what happens. Some things may have no particular effect, and some things may have negative effects, there’s so many different things to try. After all, the worst that can happen is that you cause the mansion to explode, destroying everything in a five-mile radius, and, who’s going to notice something small like that? As well as there being many different ways to actually complete the game, there are also many different ways for you to die. Most are easy enough to avoid when you are trying to beat the game, so it’s not like you have to be too worried about, when you are trying to beat the game, that you’re going to die, but, it’s fun to just mess around with things and see how many possible ways you can cause your untimely demise. Again, the game isn’t something that’s going to appeal to everyone. At its base, it’s really just finding items, selecting things from a menu, and trying to figure out where to use things. If you enjoy the type of game though, there really is so many things that you can do, so many possibilities of things to try out and paths to take, that it’s fun to just sit down any time and play. Oh yeah, and you can microwave a hamster too.